On 1 January 2017, Braam Malherbe and Wayne Robertson left Cape Town for a demanding transatlantic row without assistance or support. 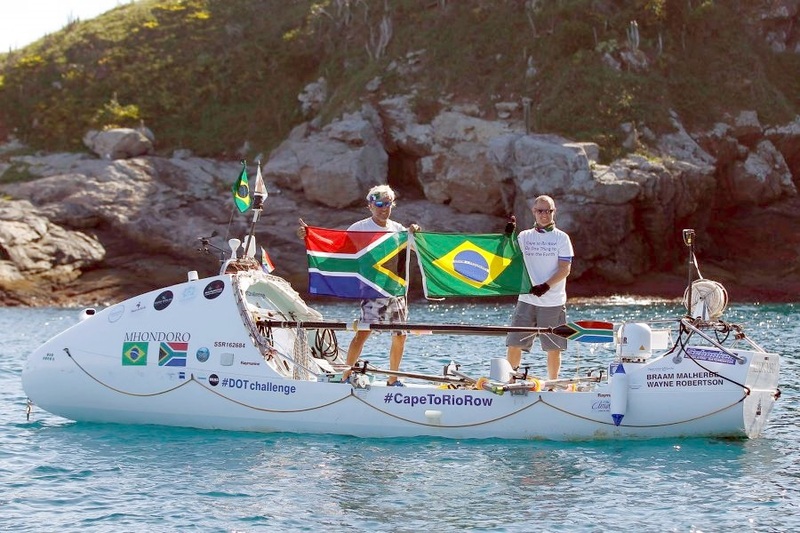 After rowing in two-hour shifts, 24 hours a day for 92 days, they completed their 8100km journey from Cape Town to Rio De Janeiro. Motivation is extremely important when your day-to-day includes months of isolation on the wide-open sea, strained muscles, salty blisters, sea storms, extreme waves and near-collisions with massive tankers. “The chances of the ship hitting us were very real… The vessel approaching was about 600ft long but 105ft wide. This was the scary part. If she so much as nicked us it would be game-over,” continues Braam. Lonely and at times terrifying, the ocean also gave them some wonderful memories. According to the duo, swimming in bright blue waters with colourful silvery fish under the bright Atlantic sun are the moments that get you through. There was a lot of excitement, and a bit of relief, when they took their first steps onto Brazilian land, but the team are now delighted to be home with their loved ones in Cape Town. Now that the journey has come to an end, they’ll be swapping out the desalinated water with a refreshing G&T at Shimmy for their welcome-home event. It’s time for them both to kick back and relax while they tell us more about their journey. Not everyone can do what Braam and Wayne do, but you don’t have to row unassisted across the ocean to make a difference, you just have to Do One Thing (DOT) each day, no matter how small. Stop using straws, try Meat-Free-Mondays, recycle your shower water or swap one of your drives for a walk. The tasks are easier than you think. Think about it. If you saved, for instance, 1 litre of water every day by turning the tap off when brushing your teeth, and you got your friends and family to do the same, and they, in turn, got all of their family and friends to do the same, in a short time, by working together you would have saved thousands of litres of water. And all by making a small change in your daily routine, which didn’t cost you a thing, saved you money and of course, more importantly, precious drinking water. The DOT Challenge app is for free and you find out how you can help save water, reduce waste, and protect the environment. Read more about the Row Cape to Rio journey here. Good for Braam and Wayne and DOT. But people must not forget that we as individuals are all operating within a macro system that is created by big business in conjunction with government regulations and the macro system is in many respects destructive of the biosphere. For instance fossil fuel companies are producing products that we know are destroying the biosphere and yet their activities are welcomed by governments. The companies’ plans to frack for shale gas in the Karoo is just one example of potential biocide being sanctioned by government. We have to create a context in which biocidal activities of any kind are simply not allowed otherwise humanity will go down in history as a perhaps glorious but failed experiment.